Do we want to look better or get better? In 2015 I wrote this short blog. I think it's worth revisiting and seeing how it can challenge us today. I think we care a little too much about what things look like and not enough about actually improving! The Cleveland Browns are getting new Jerseys and several of their players are all over Social Media talking about how great their new uniforms are. One of Cleveland players tweeted, “Best jerseys in the league! Hands down! We have 9 different color combos! Now lets think about this for a minute. The Browns are something like 84 wins and 172 losses since 1999 and the players are excited because they are getting new jerseys? The reason the Browns have lost 170+ games has nothing to do with lack of color combinations, it has everything to do with lack of performance on the field. You don’t hear players from winning teams like the Patriots, Seahawks, or Denver talking about how cool their Jersey’s look. If we want to succeed or move forward in our faith, family, and finances we need to take more time in self evaluation, hard work and playing better, and less time in making sure our uniform looks pretty. Ok, so let's take a look at how those brand new, 9 different color combos improved their teams performance. Since bragging about their brand new jerseys, the Cleveland Browns have won 4 games and lost 34. 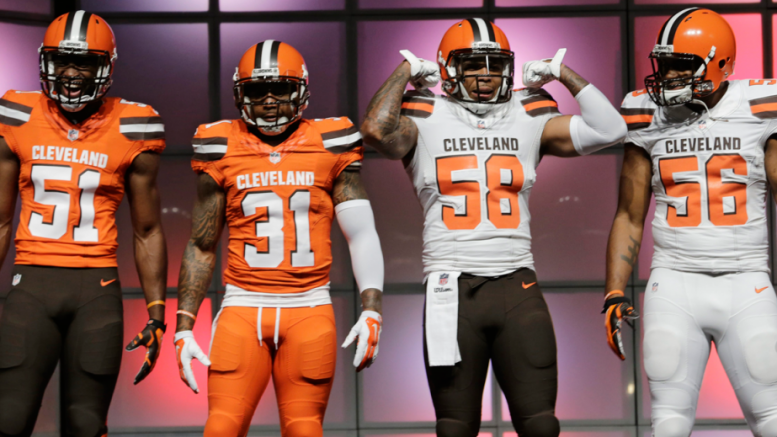 Looks to me like the Browns are due for new uniforms again. The reality is that far too many times we as people work harder on looking better than we do at being better. What is the goal of your organization? What are three things you need to improve personally to help reach that goal? What are three things your department / organization can do to improve performance? What is keeping you from doing those things today? Every morning when you and I wake up, we have the opportunity to do something very powerful. We have the opportunity to improve. Lets take advantage of it.